I am now one step closer to fulfilling God's will for my life. 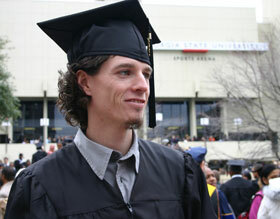 On Saturday, December 17, 2005, I graduated from the College of Arts & Sciences at Georgia State University with a Bachelor of Science degree in Computer Science. I am now focusing full-time to the music ministry. In order to be fully dedicated to music, I have decided not to pursue a job. My only means of income will be through my music ministry. This said, I am actively seeking churches and other venues to both perform and lead in worship. If you would like to have me lead worship at your church or do solo work for your event, please contact me via the contact page. Dalton Web Design and Hosting by Yaeger Design.